What is the Evaporative Emission Control Canister all about? Have you ever been around a vintage or classic car that emanated a raw fuel odor, yet no leaks were apparent? Gasoline vapors are very harmful if inhaled; they contain damaging chemicals such as benzene and toluene, which can cause headaches, nausea, and breathing problems. Vehicle manufacturers are required to limit the amount of fuel vapors that can be emitted from a vehicle. The evaporative emissions system consists of a charcoal canister, valves, hoses and a sealed fuel cap. When fuel vapors are produced inside the fuel tank due to evaporation, they are collected inside the charcoal canister, or evaporative emission control canister. 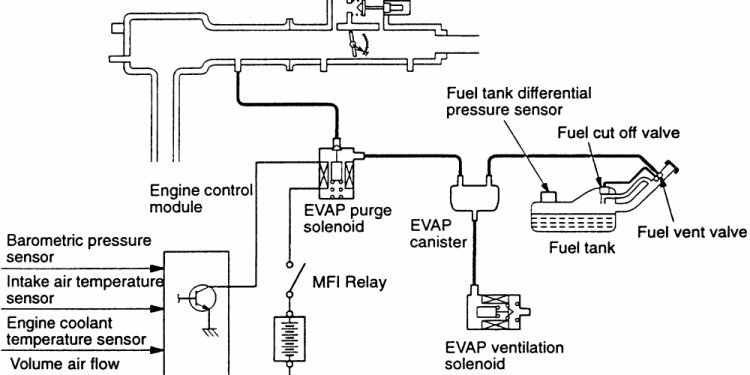 At a time determined by the engine control module, the fumes collected in the charcoal canister are purged through a valve and sent into the engine to burn as part of the air/fuel mixture. Dust and dirt from regular driving conditions can accumulate on the emission control canister, causing the purge and vent solenoids or valves to fail. It is also possible for the charcoal canister itself to crack either due to impact or harsh environmental conditions. When this happens, raw fuel or fuel vapors are lost into the environment around your vehicle, and a noticeable fuel smell can occur. Many evaporative emissions-related Check Engine light codes are caused by a loose or leaking fuel cap. Though regular maintenance or scheduled replacement is not necessary, the charcoal canister can become clogged from moisture or contaminants in the fuel. If the charcoal canister is damaged and leaking, or if a diagnosis determines the charcoal canister or one of its components is responsible for a Check Engine light illuminating, have the evaporative emission control canister replaced by one of our expert mechanics. What common symptoms indicate you may need to replace the Evaporative Emission Control Canister?